What is this game of rocks and brooms all about? 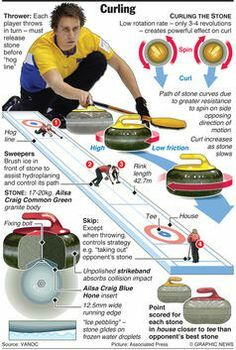 Curling is a sport in which two teams of four players each slide 44-pound (22-kilogram) granite rocks (also called stones) down a sheet of ice toward a target, or house, at the other end. Each team tries to get more of its stones closer to the center of the house than the other team. Read on for a complete breakdown of curling’s basic elements. Each player on the team throws two stones in each end. Each team throws 8 stones in an end. The players throws two stones per end, alternating with the player on the other team who plays the same position. Each stone must cross the far hog line, the thick line across the sheet in front of each house, except when it has hit another stone in play. A stone that completely crosses the back line or touches the side line is removed from play. Right-handed players deliver from a “starting block” called the hack to the left of the center line. Vice versa for left-handed players. A stone must be released before it reaches the hog line. A stone that has not been released from the player’s hand may be returned to the hack and re-delivered as long as has not reached the tee-line, the line across the middle of the house. When delivering a stone, the player should slide toward the skip’s broom. When a rock travels down the ice, depending on its rotation -- which is applied intentionally -- it will curl, or bend, one way or another. How much (or little) a rock curls or bends, depends largely on the conditions of the playing surface. A clockwise rotation (known as an In-turn to a right-handed player) will cause the stone to curl left to right as it travels down the sheet. A counter-clockwise rotation (known as an Out-turn to a right-handed player) will cause the stone to curl right to left as it travels down the sheet. The terms “no handle” or “lost handle” refers to a stone sliding without rotation. Sweeping affects how much a rock curls and causes it to travel farther. The lead, second, and third all take turns sweeping the rocks. The skip, who is like the team’s quarterback, is the only one who doesn’t regularly sweep stones. Sweeping will not make a stone travel faster, but can help it slide an additional 15 feet. For further information, see Sweeping Rules. Once all 16 rocks have been thrown down the sheet of ice, the score for that end is counted based on the final positions of the stones in the house. Only one team can score in an end. A team scores one point for every consecutive rock that it has closer to the center of the house than their opponent. The thirds or vice-skips should agree on the score before removing stones. All other team members should wait outside the house, on the far side of the hog line. Any measurements required should be conducted by the vice-skips. The 3rd or vice-skip is responsible for posting the score. The team that scores will go first in the next end. The lead throws the first two rocks of the end and then sweeps the next six. The lead must be very good at throwing guards (stones that stop in front of the house) and be a strong sweeper. New curlers typically start out playing lead as they build their skills and knowledge of the game. The second throws the third and fourth stones of the end and should be strong at making take-outs (hitting an opponent’s stone off the sheet). The second sweeps the first two stones and then the final four of the end. The second and the lead need to be in sync when sweeping together. With experience, sweepers can judge the weight of the stone (how hard it is thrown) and can begin sweeping a light stone (softly thrown) before a skip’s direction. The third (or vice skip), who throws the fifth and sixth rocks of the end, must be good at all shots, but especially draws (stones that stop in the house). It is the third’s job to set up the shots that will be thrown by the skip, and to help the skip discuss the strategy of the final two stones of the end. The third also posts the score at the conclusion of each end. The skip is the captain of the team and decides the strategy. It’s the skip’s job to tell the other players where to throw their shots and when to sweep. The skip also delivers the last two shots of the end. The skip must be good at all types of shots. Back end: Refers to the last two players on a rink – the third and skip. Back line: The line across the ice at the back of the house. Stone which are completely over this line are removed from play. Back of the House: Portion of the house between the tee line and backline. Biter: A stone that just touches the outer edge of the house. Biter Bar: A measuring device used to determine if a stone is in the house. Board Weight: A shot thrown with just enough weight to come to rest just beyond the back board (end of the sheet). Also called bumper weight. Bonspiel: A weekend-long tournament in which curlers compete. Brush / Broom: A device used to sweep the ice in the path of a moving stone. Burning a rock: A rules infraction that happens when a player touches a stone with their broom as it travels down the sheet. Curl: The amount the stone bends while traveling down the sheet. Draw: A stone that stops in the house. Also, the start time of a game – Draw time. Draw Weight: The momentum required for the stone to reach the house at the far end. Eight-ender: A perfect end where every one of the team’s stones scores a point. This is extremely rare, and picture-worth! End: The period of play in which both teams deliver all 8 of their stones. 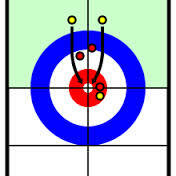 A curling game typically lasts either 6, 8 or 10 ends. Extra End: If a game is tied at the end of the regular number of ends, play continues until a team scores at least one point to win. Five & Under: Refers to an event in what participants must have 5 or fewer years of curling experience. Flash: To completely miss a shot, typically a take-out, and pass through the house without touching other stones. Front end: Refers to the first two players on a rink – lead and second. Front of the House: The portion of the house in front of the tee line. Gripper: The rubber sole of one of your curling shoes. It helps you keep your footing on the ice. Guard: A stone placed in a positon to protect another stone. Hack Weight: A shot thrown with just enough weight to come to rest near the hack. Hammer: The last rock of the end, a strategic advantage. Handle: Rotation placed on the stone at time of delivery. Heavy: A stone delivered with greater force than necessary. Hog Line: A thick line 10 meters from the hack. House: Also known as the rings. The “bull’s eye” at each end of the sheet of ice. It consists of circles, called the 12-foot, 8-foot, 4-foot, and the Button. In-Turn: The rotation applied to a stone that causes it to rotate clockwise for a right-hander. Light: A stone thrown with less weight than was required. Line: The path traveled by the stone. Out-Turn: The rotation applied to the stone that causes it to rotate counter-clockwise for a right-hander. Mixed: A team consisting of 2 men and 2 women in which positions must alternate gender. Narrow: To throw a stone off the target in the same direction as the intended path of curl. Pebble: A fine spray of hot water applied to the ice before play. Pick: When a stone hits or picks up a small piece of debris causing it to change direction. Pin: The center of the button. Port: An opening between two stones wide enough for a stone to pass through. Rock: Also known as a stone, the granite playing piece that a curler delivers. Regular-sized rocks weigh approximately 42 pounds. Sheet: The frozen playing surface on which the game is played. Like a bowling lane. Shot Rock: At any time during the end, the stone closest to the button. Slider: The slippery (usually Teflon) sole of one of your curling shoes. It helps you move or slide along the ice. Stabilizer: A delivery device used instead of a broom. Steal: To score when you do not have the hammer. Sweep: Direction given by the skip or third to begin sweeping the stone. Turn: The rotation placed on the stone. Wick: When a stone touches a stationary stone just enough so that it changes direction. Wide: To throw a stone off the target in the opposite direction of the path of curl. Always face your skip so that you can see stones in front of you. Normally two sweepers will sweep each stone, but it possible for all four team members to sweep a stone. You can always sweep your own stone, with one exception – only one person can sweep a stone behind the tee-line. An opposing skip may also sweep an opponent’s stone behind the tee line. It is the responsibility of the sweepers to announce if they have touched the stone (called burning the stone). The stone will be removed from play. The sweeping motion should not leave any debris in front of a moving stone. The final sweeping motion should finish outside the path of the stone. There must be brush head movement in the sweeping motion – sliding the broom in front of the stone is not permitted. Draw: A shot that stops in front or in the house. Take-out: A shot that hits and removes another rock from play. Guard: A stone positioned in a manner as to protect another stone from being eliminated or to protect the opponent from making their desired shot. Freeze: A stone that stops against another stone. Come-around: A draw that curls around a guard into the house. Raise: A draw shot that bumps another stone into the house or a take-out that promotes a stone into another stone in an attempt to remove it from play. Hit and Stick: A take-out that remains very close to the position of the removed stone. Hit and Roll: A take-out that rolls some distance from the removed stone. Peel: A shot designed to remove a guard as well as the delivered stone itself. A stone must be released before crossing the hog line and it must cross the far hog line in order to remain in play. The Free Guard Zone (FGZ) is the area from hog-line to tee-line (not including the house). See the shaded area in the diagram to the right. Until the first 5 stones have been delivered (3 by the team without the hammer and 2 by the team with the hammer), stones in the FGZ may not be removed by an opponent. If they are removed, the stone is replaced and the opponent’s stone taken out of play. Often times you may hear sweepers call out a number. This refers to the zone (1-11) they anticipate the stone to stop. This is a communication tool used to let the skip know the weight of the stone. 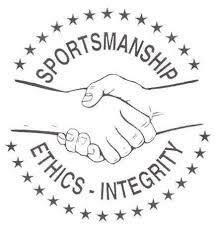 Curling has its rules to govern play, but equally important is the way you conduct yourself while curling – sportsmanship, etiquette and honoring tradition. Curlers play to win, but never to humble their opponent. A curler should never attempt to distract an opponent or otherwise prevent someone from playing their best. No curler deliberately breaks a rule of the game or any of its traditions. If a curler inadvertently breaks a rule, he or she should immediately divulge the breach. Clean, Rubber-soled shoes. A pair of shoes dedicated to curling is recommended so that debris is not transferred to the ice. The shoes you wear for curling should only be used for curling, and can be left at the club. Layers of clothing. Light-weight jacket or sweater. Again, clean shoes…..Sand and especially salt can ruin the ice surface. It is extremely important to be ready to go on the ice prior to your scheduled game. Remember, seven others are waiting on you. You should arrive at the club about 15 minutes before your draw time so you are ready to go on the ice at the draw time. If you are going to be late, please let your skip know. If you are late, you may begin sweeping immediately, but must wait until the end in progress is completed before you can throw stones. Ensure you have all the equipment you need (slider, stabilizer, broom) prior to game time. Practice is permitted before games; however do not throw stones on the sheet your game will be played on. The vice skips are responsible for the coin-flip to start the game. All players shake hands with their team members and each opponent before and after the game. It is customary to say “Good Curling” while doing this, and introduce yourself if you don’t know the other curler. It is everyone’s responsibility to keep the ice clean. Please pick up any debris that you might find (lint, hair, dirt, etc.). However it is unlawful to remove any foreign object from beneath a moving stone or from one that has come to rest. If debris is under a stone, please wait until the end is finished to remove it. No food or beverages are permitted on the ice, except water in closed containers. No one should deliberately delay the game. Do not walk in front of opponents or make distracting movements when they are in the hack preparing to throw or while they are watching their delivered stone. Do not move or talk while anyone else is delivering their stone. Avoid standing behind the hack unless it is your turn to throw. Sweepers should stand off to the side of the sheet, between the hog lines. If a sweeper touches a moving stone (burns the stone), they should immediately announce it. If you have personally moved a stationary stone, immediately notify both skips so that it may be replaced to the satisfaction of the opposing skip. The term “ice” is similar to “fore” in golf and means that you are blocking the path of a stone or view of a curler. Please move to the side immediately. Get into the hack as soon as your opponent has delivered their stone. The lead should get the skip’s stone ready for play by placing it at the hack. The skip should let the other three team members know the strategy prior to delivering the stones. 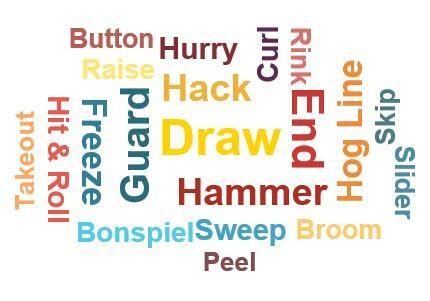 Skips should stress to their team constant instruction throughout the season, including points of ice etiquette. Skips and thirds should keep their brooms behind them while their opponents are throwing. Only the skip of the team throwing their stone should be in the house. The opposing skip should stand behind the back line. The vice-skip is responsible for scoring and measuring stones. All other players must stay out of the house. Once the score has been decided, others should help clear the stones. The person delivering the first stone of the next end should be preparing to throw their stone, not helping to clear stones. Although some clubs consider it proper etiquette, at MCC we do not practice the habit of getting the opponent’s stone ready for play. One of curling’s traditions is to compliment an opponent’s good shot, while at the same time, withholding any comments on a poor shot or competitor’s misfortune. All players shake hands with your team members and each opponent after the game. It is customary to say, “Good Game” or “Good Curling” afterwards. The losing team is responsible for cleaning the sheet and putting the rocks back; although it is customary for the winning team to assist as well. Behind each sheet in the lounge is a table. It is customary to sit down and chat and share a drink with your team members and opponents after a game. It is generally agreed that curling was developed in Scotland in the 16th century on frozen marshes. 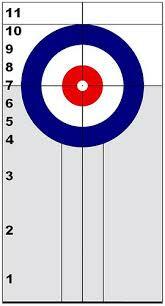 Curling was first an Olympic medal sport in 1924, but did not obtain full medal status again until 1998. Curling is played in 48 countries worldwide. Canada leads the way with around 1 million active curlers. 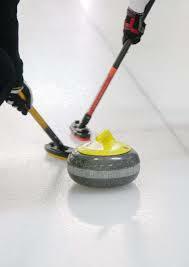 The modern curling stone is made of granite and weighs about 42 pounds. The first known US curling clubs were located in New York City, Detroit, Milwaukee and Portage, WI. On average, an athlete can walk up to 2 miles in an 8-end game. Membership in the US was 16,000 in 2013 with 165 member clubs in 40 states. No longer a cold-weather-only sport, new clubs are now found in warmer states such as Arizona, Florida, Georgia, South Carolina, Tennessee (started by our own Larry Unterberger) and Texas.